The brewing process can generally be defined as 4 key steps; Mashing malted barley (possibly with other cereal additions), boiling and bittering of the resulting sweet wort, fermentation of the boiled wort and then conditioning of the resulting beer before packaging. All of these steps are important in producing great beer; however they are all redundant without a well-executed mash. In this process, the malted barley is steeped in hot water for proximately an hour in order to activate certain enzymes that break down the complex starches of the grain to fermentable sugars. The end-point of the mash process is not typically measured in the microbrewery; however specific gravity will usually be taken after transferring the sweet wort into the copper to ensure that the mash has produced the desired amount of sugar for the style of beer. The aim of this project was to run an analysis of the mash process using the CDR BeerLab® across 3 styles of Long Man beer with a view that it may be possible to reduce the mashing time and improve process efficiency. The Long Man Brewery is situated on Church Farm in Litlington. Based in the South Downs National Park it prides itself on producing fine Sussex Ales with the core aim of environmental sustainability. 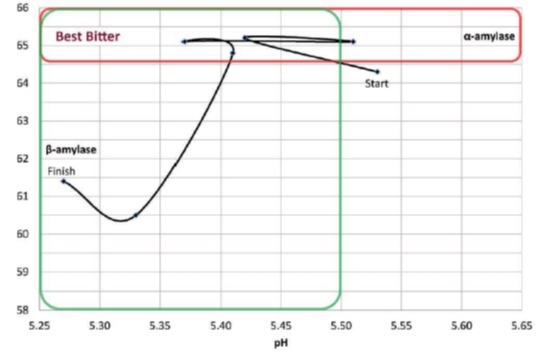 The study looked into the production of fermentable sugars versus starch alongside measurements of pH and temperature as well as free amino nitrogen (FAN). 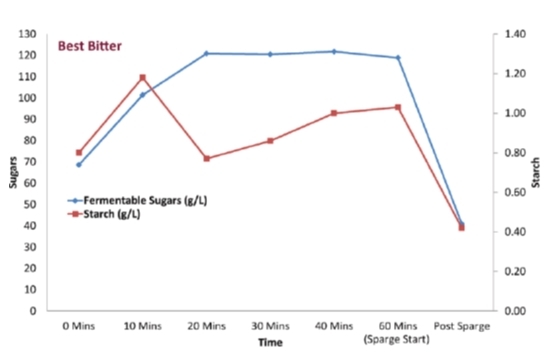 The idea was to show that in a couple of hours of sampling and analysis we could demonstrate what is happening in the mash tun in terms of sugar production from the mashing enzymes and its correlation with pH and temperature changes (if any). In 20 minutes they have completely converted all the starch in fermentable sugars!! Mash spends the majority sitting directly in the activity region for both enzymes. You can find similar results also for APA and Long blonde beer. You can read the case study written by Dr Lee Walsh of QCL, CDR BeerLab® distributor in UK. A sample of each beer was taken post boil and tested for FAN. Two of them was found with a low level of FAN for an healty yeast growth. By knowing the FAN for each brew yeast nutrient can be adjusted to ensure healty yeast growth, avoiding stuck fermentations and saving time and yeast. FAN is important in beer as well to extend its shelf life and to avoid off-flavours. Fermentable sugars and starch analyses can give you the possibility to shorten the mashing time. FAN analysis gives you the possibility to manage at best the yeast growth avoiding to lose time and money. With CDR BeerLab® YOU are able to improve your in-house testing improving the efficiency of your beer making process. Analysis of Mashing in the Brewery was last modified: March 15th, 2018 by CDR s.r.l.